Associate Professor Suki Goodman from the School of Management Studies reflects on UCT’s decision to offer Massive Open Online Courses in the context of global changes in higher education that are increasingly mediated by technology and the internet. She talks specifically about the necessity of evaluating and monitoring this process so that lessons, learning and feedback can be applied to UCT’s broader offerings in face to face, blended and online teaching and learning contexts. 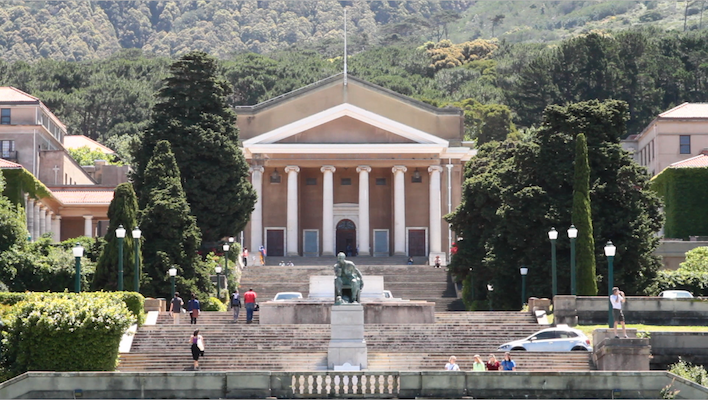 This post is an edited version of a speech given at the UCT MOOCs launch event on 24 February 2015. The writing is on the wall, or more appropriately the dashboard. The world is changing, everything is moving, the rate of change accelerating and technology is the engine driving it all. What a few years ago was fantasy and Sci-fi is currently being operationalised. The educational revolution, the revolution in education is happening, it’s happening now. The introduction of the massive open online courses (MOOCS) and other UCT online investments like the Faculty of Commerce’s online Postraduate diplomas means that we retain our currency. We showcase our capacity to play in this space, a space occupied by the biggest and the best universities in the world. This allows us to contribute to the global conversation in education taking place. The most successful institutions of higher learning in the future will also be the ones most advanced and proficient in online – those that know how to maximise the power that this space has to offer. And that maximisation will ultimately come from academics, learning practitioners and educational researchers reflecting on and refining what works, how it works, and what takes for it to work – for people to learn in virtual environments. They’ll need to ask questions pertaining to sustainability and revenue generation, how this revolution changes what we know about best practice in teaching and learning, how can it help us prepare scholars to enter universities better equipped, how we manage fulcrum transition points like the transition from UG to PG, what can we do about throughput that we haven’t been able to do before….and these are just some of the emerging questions! Throughout our team’s development of an evaluation strategy with the Centre for Innovation in Learning and Teaching’s (CILT) MOOC Implementation team we have found an underlying motivation gravitated towards these questions: how we use this opportunity of developing UCTs first MOOCs to master aspects of the online learning territory, so that we can ultimately all benefit from new-look pedagogy – pedagogy that can feed into residential, blended and online teaching. There’s a recognition that teaching excellence now, already, and guaranteed into the future is going to be heavily influenced by our ability to harness the available technology and the sooner we learn how to harness it for the good, to learn how to learn, to learn how to bring about learning the more successful we are likely to be. So the MOOC project means that, for example, the staggering science involved in Prof Mark Solms’ neuropsych work – science that is changing how we will eventually understand what it means to be human – is available, accessible and open to an ever increasing audience in the form of the free online course What is a mind? That in and of itself is a spectacular thing. But also impressive are the massive “behind the scenes scenes” – the internal developing and unfolding processes that are being bedded down to make these MOOCS happen – the across university interactions, the horizontal and vertical networks of stakeholder engagements, the project management, CILT’s learning design team bedding down into the belly of the institution to the heart of departments’ core business of translating research into teaching not to mention the the mapping and managing of new data points, the analyses of new sets of learning analytics and…much more. Our evaluation strategy is designed to give some structure, some framing to all this other stuff and the strategy demands that at every level of the UCT MOOC project stakeholders measure, monitor and reflect on MOOC performance and the initiatives emerging outcomes. For a large, heavy and in many ways “old-school institution” like UCT the agility required to be successful in MOOC-land constitutes a significant departure from many aspects of business-as-usual…but perhaps it is in the vision and implementation of these new ways that continued flourishing of this great academy is fortified and with that the assurance that we keep on trending.